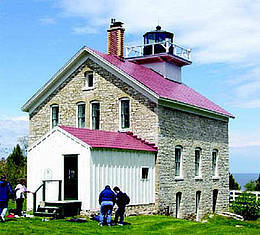 The Pottawatomie Light on Rock Island is the oldest of Door County’s Lighthouses. This lighthouse protects the passage between Rock or Pottawatomie Island to the South and St. Martins Island to the North. This passage acted as the early gateway to Green Bay from Lake Michigan. In 1820, Green Bay and Prairie du Chien were Wisconsin’s only important population centers. After the completion of the Erie Canal in 1825, the already thriving trade between Green Bay and the cities of the eastern Great Lakes dramatically increased. In response to this increase, thirty Detroit merchants and ship owners petitioned Congress, in 1834, to build a lighthouse on Rock Island to assist ships through the Rock Island Passage. Congress approved the request and appropriated money for construction. In April of 1836 a contract was let for the construction of a 30′ stone tower, 18′ in diameter at the base and 9′ in diameter at the top. An 11′ diameter lantern deck on top of the tower was the base for an octagonal iron lantern. The lantern contained a Winslow Patent design light with eleven oil lamps and eleven 14″ reflectors. A 34′ x 20′ story and one-half stone dwelling was built separate from the tower. 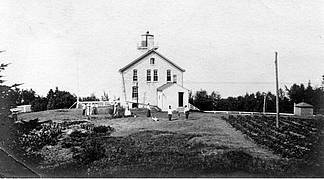 The Lighthouse Authorities accepted the new station in October of 1837. The first keeper of the lighthouse was David E. Corbin. Corbin was a veteran of the War of 1812, former member of the Fort Howard garrison, and one time employee of the American Fur Company. Because the lighthouse was located at the edge of a steep cliff that extended in both directions, Corbin had to cut a road nearly a mile long to the south. This road ended at a landing near where Chester Thordarson later built his great stone boathouse and hall. All of Corbin’ s supplies, including drinking water, had to be carried along this road to the lighthouse. In 1858 the Light House Board Crew razed the original tower and dwelling. Apparently the wrong mortar was used during the original construction. Because of this mistake, the structure was badly damaged by moisture in 1836 and could not be repaired. In place of the original structure the present day 33 ‘x 31′ dwelling with an 8’ square wooden tower was built. The tower, which projects through the northerly end of the roof of the dwelling, was topped by a nine-sided lantern. Installed in the lantern was a fourth order Fresnel lens which provided a fixed white light visible 14 nautical miles in clear weather. The last civilian keeper is listed as John Fitzgerald. (Reference: “The Lighthouse Keepers of Lake Michigan” published by the Great Lakes Lighthouse Research, 6262 Blossom Park Drive, Dayton Ohio 45449.) Ernest Lockhart was the last civilian assistant keeper of the lighthouse. 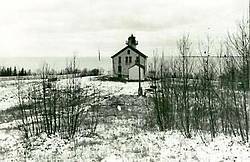 After civilian retirement in the early 1940’s the lighthouse was manned by Coast Guardsmen. In the 1980s the lantern was disassembled and the lens removed in preparation for automation. The station was automated with a battery powered beacon which was placed on the lantern deck. In 1986 the batteries were replaced by solar panels. In 1989 Coast Guardsmen, assisted by a helicopter, erected the present steel tower west of the dwelling and moved the beacon to it.